The depiction of Markandeya's vision is one of the most potent and mystical images found in the painting of the Panjab Hills. This event is recounted in the Mahabharata epic, and in many other texts written about the great Hindu god Vishnu. The story relates how the deathless sage Markandeya wandered through the immense Night of Brahma, the interval between cycles of creation, when all was contained within the sleeping body of the god Vishnu. To discover the truth, Markandeya entered the cosmic ocean of existence and swam there for countless time. 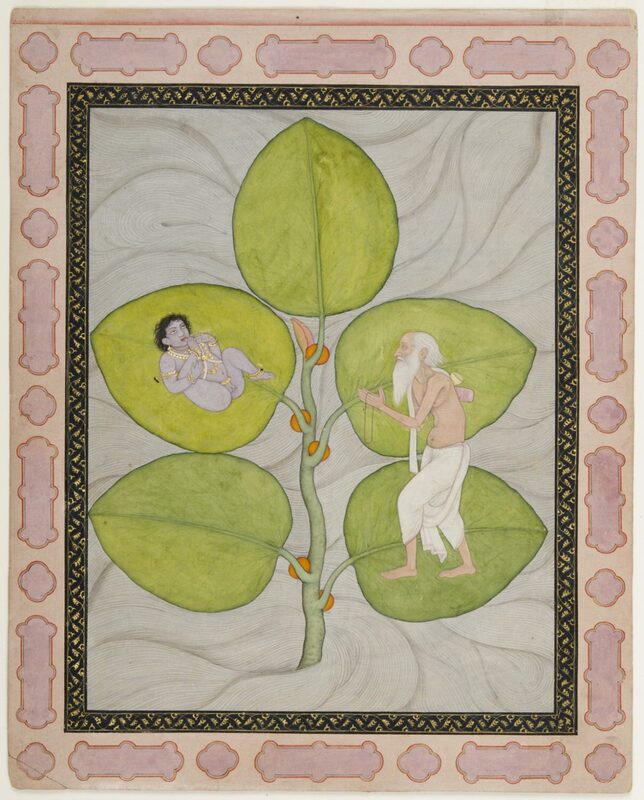 Finally he saw a light emanating from the radiant body of a child floating on the sprig of a banyan tree. The child showed Markandeya the secrets of creation, explaining that he was Vishnu, father of the universe, giver of life who brought forth creation and took it back into himself.